Charisma was originally a physical board game. The iPhone version makes a number of changes to the game mechanism to adapt it to a digital format. The game is available HERE and HERE. In the game a series of questions are asked on six topics, all of which relate to how we communicate with others. As you give better answers you move around the board more quickly and the fewer steps it takes you to complete the game, the nearer to being the ultimate ‘Problem Solver’ you will be. 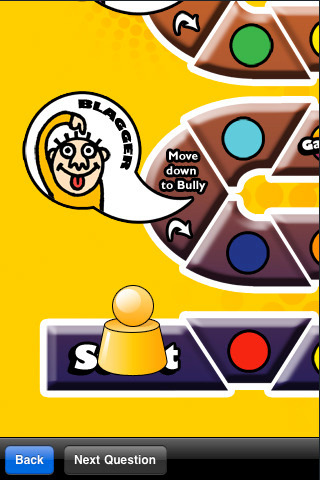 There is a social gaming element with friend’s progress being visible as they play the game and in-game chat by tapping on a friend’s game piece. This functions across platforms. Additionally, as this game is targeted at an educational environment the licensing system allows a teacher to assign licence codes to their pupils and track their progress.